Romantic, liberating and totally addictive, Fifty Shades of Grey is a novel that will obsess you, possess you, and stay with you for ever. When literature student Anastasia Steele interviews successful entrepreneur Christian Grey, she finds him very attractive and deeply intimidating. Convinced that their meeting went badly, she tries to put him out of her mind - until he turns up at the store where she works part-time, and invites her out. Unworldly and innocent, Ana is shocked to find she wants this man. And, when he warns her to keep her distance, it only makes her want him more. But Grey is tormented by inner demons, and consumed by the need to control. As they embark on a passionate love affair, Ana discovers more about her own desires, as well as the dark secrets Grey keeps hidden away from public view ... About the Author E L James is a former TV executive, wife and mother of two based in West London. Since early childhood she dreamed of writing stories that readers would fall in love with, but put those dreams on hold to focus on her family and career. 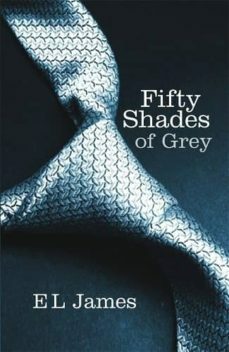 She finally plucked up the courage to put pen to paper with her first novel Fifty Shades of Grey. Sí el libro de quíen todo el mundo habla y top de ventas pero es verdaderamente "flojo" y sin un argumento sólido y decente.